Geotechnical Gauge, Soils Classification Reference Chart - Gilson Co.
HM-512 Geotechnical Gauge is a water-resistant 5x7in (127x178mm) plastic card with lanyard that contains a wealth of information for classification of soils. 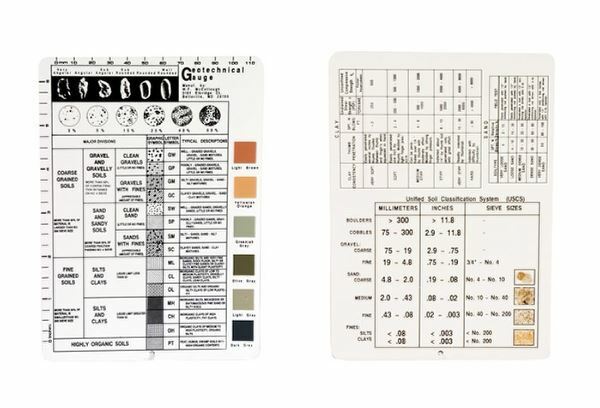 This two-sided card has six color chips, four patches of sized grains, and four tables for classifying soils by particle size using the Unified Soils Classification System. It also categorizes coarse and fine-grained soils into fifteen descriptive categories from gravels and sands to silts and clays, as well as sand by type from very loose to very dense, and clays from very soft to hard. In addition, categories are defined by appearance, by handling properties, or by ranges of field and laboratory test results. Edges of the card have separate 0—6in and 0—110mm scales.